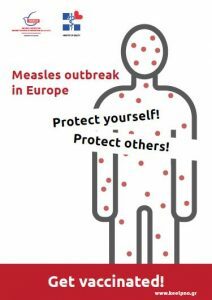 Measles is a highly contagious disease transmitted through human-to-human contact but also in public spaces, even in the absence of person-to-person contact. Following exposure, approximately 90 percent of susceptible individuals will develop measles. Spots in the mouth – These can look like grains of salt. A red rash that can form red patches and starts on the face and spreads to the body. You can also read the article in Greek language here.